Welcome to the Keilor Historical Society. The Keilor Historical Society was formed in 1988. 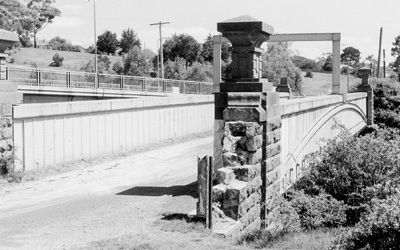 Photo left: Old Iron Bridge, Keilor. We have taken part in so many projects such as our traditional Harrick's Cottage Open Day, the Festival at the Keilor Branch Library, the opening of the new Keilor Community Centre. And now we are going to start on some further work related to the Civic Collection and Artworks of Keilor. Our work ranges across a number of topics and our aim always is to share what we know and to archive and maintain our collection so that we can display further works when needed. We never know where we might be able to find out a great deal more about this region so we work with the community to further engage and talk to them about what we do. This year's exhibition 'Myriad of History Tales: countless stories about Keilor's Heritage', documents some of the work that has taken place since 1990. We have undertaken work that has required a great deal of devotion and dedication to research detail. The results are there for others to learn and read about. We can show others about the amazing region called Keilor. Monthly meetings are held on the second Wednesday of each month at the Keilor Community Centre, Old Calder Highway, Keilor Village at 7pm. The aim of the Keilor Historical Society is to always promote the history of the region. During the past three decades we have been involved with many varied projects and assignment. We have set up an heritage walk with panels displayed throughout the village. This walk records the history and importance of the selected sites and buildings. We have recorded the history of Keilor for all to learn about.